10. The only other color in the black and white music video is seen in the red “YM” symbol seen throughout. 9. 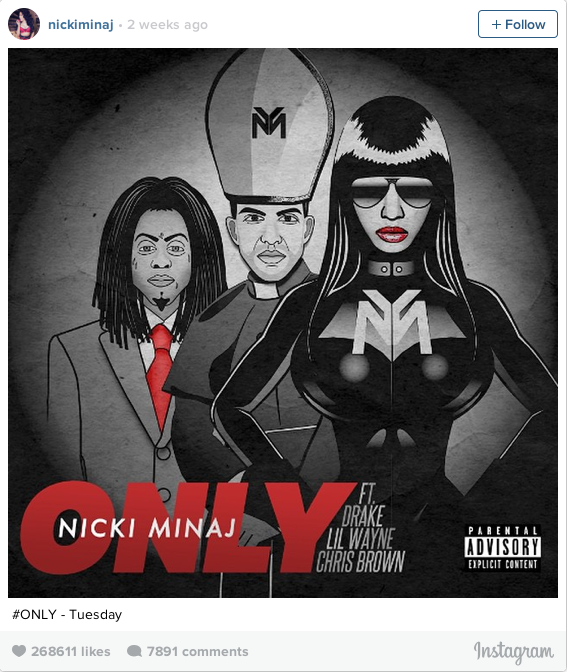 Nikki Minaj plays the role of dictator in the propaganda-infused music video. 8. Her cartoon-self is seen marching among the armed forces that all are wearing the “YM” (stands for Young Money, obv) symbols on their uniforms, which is strikingly similar to the Nazi’s “SS” symbols that were worn by German soldiers in World War Two. 7. The video also features a lot of bombs and other miscellaneous weaponry. 6. All of which Nikki is more than willing to glamorize. 6. Drake, who is half-jewish, plays the role of a priest in the video. 5. Breezy is the role of an army lieutenant. 4. And Seizy Weezy is seen looking sketch AF on the television screen. 3. The four are seen on stained-glass windows, implying that under Nikki’s rule there would be no separation between church and state. We’re sure this implication has Illuminati theorists going ape-s***. 2. Together, the Young Money Crew proves they’re more than willing to replicate one of the most savage political parties of all time.